It's great to see the success that wife/husband duo Whitehorse have had. There are few musicians in Canada who can craft songs the way they can, both together and independently. The new album, Leave No Bridge Unburned, is a slight departure for the pair. The focus has shifted from the hushed, introspective folk influence of their initial releases, to a moodier sound with heftier arrangements. Heartfelt numbers like "Dear Irony" take a backseat to more methodical and menacing tracks such as "The One I Hurt". That comes through again on "Sweet Disaster", which sees Melissa McClelland channeling her inner Margo Timmins. The noir overtones of "Tame As the Wild Ones" is striking. A surf guitar is somehow given a dark vibe on "Downtown". A stylish '60s cinematic feel powers "Baby What's Wrong". Unfortunately, the harmonies that really made the band's previous work remarkable are rarely heard here. A notable exception is the Decemberist-like "You Get Older". The sharp lyrics we've come to expect are most obvious on the wonderfully-titled "Fake Your Death (And I'll Fake Mine)". The roots rocker "Oh Dolores" and the country saloon stomper "The Walls Have Drunken Ears" provide the change of paces on the record. Leave No Bridge Unburned is not as transcendent an experience as the first two albums, but it is still a high quality record. 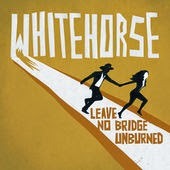 Whitehorse play Massey Hall in Toronto on May 8th. Best tracks: "Oh Dolores", "You Get Older"